I didn't watch the Academy Awards last night, but I had seen the movie "Spotlight." It's an inspirational movie that chronicles the efforts of the investigative journalism team by the same name at the Boston Globe that broke the worldwide Catholic priest child-molestation cover-up story. If you haven't seen it, you should. Earlier this morning I learned that "Spotlight" won the "Best Picture" award at the Academy Awards, much to the disappointment of the bear attack fans. But as one who has dipped his toe into the art of investigative journalism for the past three years as an amateur, I found the appreciation of the film's message reassuring in today's click-through culture. Being an investigative journalist is not only difficult, but also frightening at times, both professionally and personally. As the movie nicely documents, the revelations of corruption can shake closely-held narratives of decency and trust so critical to important societal institutions. The movie also nicely portrays how difficult it is to fact-check, obtain evidence, and clearly document the story to both gain credibility and affect change. Unfortunately, classic investigative journalism has fallen victim to increasingly limited funding and a world with a shorter and shorter information attention span. I fear the story of the financial cover-up at the American Board of Internal Medicine (ABIM) is quickly falling victim to similar pressures. With the exception of one veteran news reporter at Newsweek, Kurt Eichenwald (see here, here, here, and here), few journalists have had the interest, patience, or fortitude to expose the truth of the multi-million dollar US physician specialty Board certification racket. Perhaps, like the thought of priests caught molesting children, the thought a non-practicing physician cartel extorting high fees from their colleagues for their personal and political gain is too uncomfortable to accept. Perhaps it is too hard for patients to believe that board re-certification is not about assuring their safety, but rather for little more than money and power. But for working U.S. physicians who are still strong-armed into paying into the ABMS cartel every ten years just so they can continue to do the job they love, this coercion is all too real. Last October, I had hoped this story would be different. I was interviewed for over an hour and a half by a reporter from CNBC at my hospital who was investigating the ABMS board certification monopoly. I was told she also interviewed Richard Baron, MD of the ABIM and Lois Nora, MD, JD, of the American Board of Medical Specialties. I spent over an hour in the interview, had a cameraman shoot shots in of my office with its board certificates, and introduced the reporter to one of my patients (with permission given my the patient first) under the watchful eye of my hospital's PR department. "Finally!" I thought. But the story never aired. I called and inquired. It was an on again, off again affair, buffeted by more compelling stories of the day, I was told. Then, "we've decided to go forward." But now months later, still nothing. I believe that freedom of the press and careful investigative journalism fills an important role in our society. I still believe the day will come when the truth about the ABIM's actions will be told and thoroughly investigated to end the injustice and waste from the ABMS Board Certification monopoly. 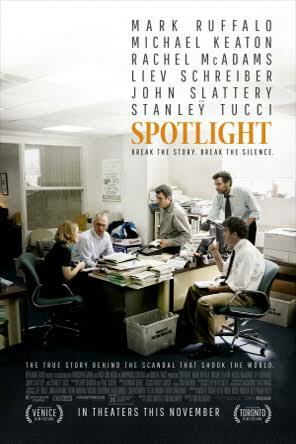 Let's hope last night's victory of "Spotlight" as "Best Picture" at the Academy Awards can rekindle main stream media's appreciation for the importance of responsible reporting unencumbered by political and financial pressures. After all, this isn't Hollywood that we are dealing with, this is real life, real doctors, and real patient care - even yours. Recently, an email was sent to all Cardiovascular Disease diplomats requesting a review of the American Board of Internal Medicine Cardiovascular Disease Examination "Blueprint" for content on the Cardiovascular Disease Examination. The email was authored by Mariel Jessup, MD, Chair of the Cardiovascular Board and George W. Dec, Jr., MD, Chair, Cardiovascular Board of Cardiovascular Disease Exam Committee (I'm not really sure how these titles differ, but I digress). The purpose of the "survey" and "blueprint" was to "assure the MOC examination is reflective of CV disease specialists are actually doing today, and we hope you share your perspectives to help get us there." Petitioning cardiovascular disease specialists through "short surveys" so the responses of physicians can be spun by the ABIM as evidence of "buy-in" by the cardiovascular community is a classic and well-recognized political tactic. I received your 11 Feb 2016 email to update the content of the Cardiovascular Disease MOC examination by way of your Blueprint Review Tool. No doubt you have plenty of people who have blindly edited your “Blueprint” without considering why we must perform the ABMS MOC program in the first place. I have no idea if this letter will resonate with you or make you seriously reconsider your support of this endeavor, but I feel compelled to notify you why US physicians are no longer content with the MOC status quo that was imposed unilaterally by the ABIM and their supporting professional organizations in 1990. MOC was a financial model that bailed the ABIM out of a financial hole then and now has created a much bigger set of problems for the ABIM. As I’m sure you are well aware, there had been no credible, independent, peer-reviewed studies that have shown the ABMS MOC program improves patient outcomes in any way. There are, however, limitless propaganda pieces written by staff at the ABIM about the purported “benefits” of MOC. Tax disclosures have shown serious financial mismanagement and erroneous tax filings by the ABIM. Most of the financial transgressions pertain to the secret creation and funneling of over $70 million of our physician testing fees to the ABIM Foundation from 1989-2007, an organization that was reportedly created to define and publish a self-generated definition of “medical professionalism” that included a “social justice” imperative as one of its prerequisites. Their $2.3 million condominium purchase in December, 2007 didn’t help either. The fact that the cost for MOC has increased $247 percent in the last 15 years (over 16%/yr – far in excess of inflation) with $55 million of physician fees paid annually to the ABIM needs serious reconsideration in this era of astronomical health care costs. The ABIM is an independent, non-profit corporation that enjoys a tax-exempt status from the federal government as a 501(c)(3) corporation with requirements to be apolitical, but lobbied Congress without disclosure – a violation of rules for non-profit status of that kind. As a 501(c)(3) corporation, the ABIM’s membership is not elected, but rather appointed (as I’m sure you both were). Conflicts of interest with the leadership remain an unaddressed issue with the ABIM and bylaws reflect they continue. One only has to see the conflicts between Christine Cassel, MD and CECity/Premier/Kaiser Health Plan and Hospitals and Robert M. Wachter, MD and IPC Hospitalist Co/TeamHealth (and their ongoing federal investigation on Medicare overbilling) to appreciate how problematic these conflicts have become for the ABIM as a credible organization to practicing physicians and patients. Furthermore, the ABIM took the unprecedented action to sue 5 physicians and sanction 134 more who were attempting to study for their certification examinations at a board review course in 2009 and then publishing a press release with the five physicians’ names in the Wall Street Journal in 2010 before due process. While the ABIM claimed “Copyright infringement” with their sanctions, none of the five physicians EVER paid a fine for such since all were covered in their actions by merger doctrine. (It’s very hard to copyright general medical knowledge.) With this move and the contract entrapment physicians must endure when they enroll in MOC, trust in the ABIM as a credible physician quality measure has been seriously compromised. Blueprints don’t restore trust. Credible, trustworthy actions that acknowledge prior wrongs and meaningful efforts to correct them does. Ending the lucrative MOC program and restoring the ABIM to an elected organization with bylaws that remove double-dipping with corporations that stand to benefit from physician certification reporting (see abmssolutions.org, for instance) would go a long way at correcting the current situation. Ending MOC busywork and retracting the failed MOC program and using credible CME to suffice in its stead would also be necessary. I propose you make these last actions your “Blueprint for Success” for the ABMS Cardiovascular Disease MOC program. Anything else will fail to restore the trust of practicing cardiologists and is doomed to fail. I wish you both the best of luck. I ask my readers to indulge me as I provide some background about the strongman tactics used by the American Board of Internal Medicine (ABIM) to protect their board certification monopoly. It started with a press release sent by the ABIM dated 9 June 2010, resulting in a story by Katherine Hobson making national headlines in the Wall Street Journal entitled "Medical Board Says MDs Cheated." Ms. Hobson also cross-posted her story on the Wall Street Journal's Health Care blog which she helped moderate at the time. With this article, the public learned that five physicians, Monica Mukherjee of Washington, D.C.; Anastassia Todor of Aurora, CO.; Pedam Salehi of Los Angeles, CA; Sarah Von Muller of Tulsa, OK and Frederick Oni of Warner Robins, GA were sued by the ABIM "for what it deemed were ethical breaches involving the disclosure of test questions—which aren't supposed to be repeated, copied or reproduced." Another 134 physicians were "sanctioned" by having their Board certification revoked for at least a year, and thousands more were sent "letters of reprimand." Labeled as an "unprecedented action," the sanctions were "immediate" and resulted in the revocation of these physicians' Board certification for at least a year or more without trial. Hiding behind the legalistic "Pledge of Honesty" that physicians have no choice but to sign when they enroll in the ABIM certification program, Dr. Christine Cassel, president and chief executive of the ABIM at the time, called the sanctions "a message and a deterrent." It's was also an unprecedented strongman tactic by a self-appointed and unaccountable non-profit corporation. Should the entire unaccountable American Board of Medical Specialties and their 24-member boards be allowed to intimidate, threaten, and professionally destroy physicians to protect their financial stranglehold on their own version of professional certification? To those in their isolated executive perches, it seems they feel they can. And so, the story does not end there. Using undisclosed methods and personnel, it seems the ABIM traced emails from a computer seized from Arora Board Review to a physician in Puerto Rico four years later. 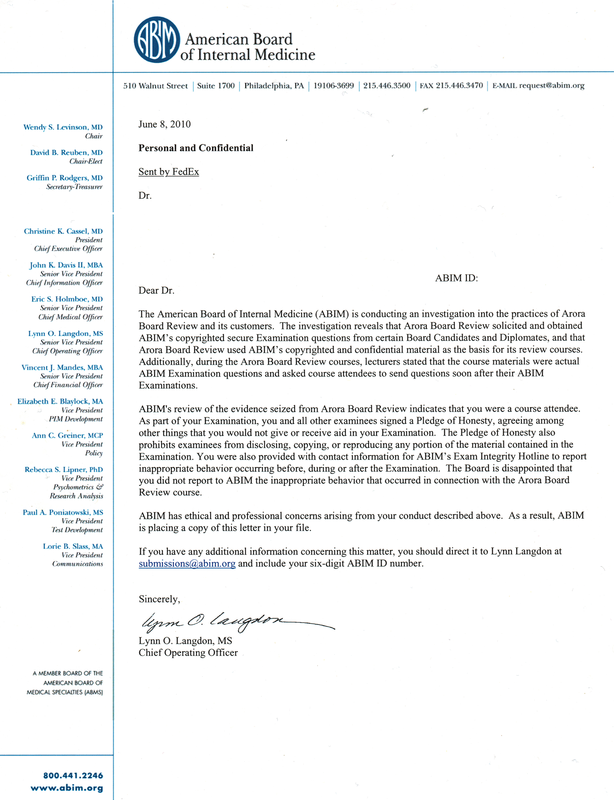 In a letter dated May 8, 2012, from Ms. Lynn Landon, Chief Operating Officer of the ABIM, Jaime Antonio Salas-Rushford, MD, was accused of sharing board review questions with the Arora Board Review course. On the sidebar of that letter were other names: Chair Catherine R Lucey, MD, Chair-Elect Robert M Wachter, MD, Secretary-Treasurer Talmadge E King, MD, President and CEO Christine Cassel, MD, Chief Information Officer John K Davis II, MBA, Senior Vice President and Chief Medical Officer Eric S. Holmboe, MD among others. With only 10 days notice, the ABIM imposed its harshest penalty: to "indefinitely revoke" Dr. Salas Rushford's Board certification and "notify the Medical Board in every jurisdiction you are licensed." The ABIM then sued Dr. Salas-Rushford for alleged Copyright infringement. What the ABIM had not anticipated is that Dr. Salas-Rushford's parents are lawyers and they countersued the ABIM. Currently, the case has moved from Puerto Rico back to New Jersey and continues in its discovery phase. 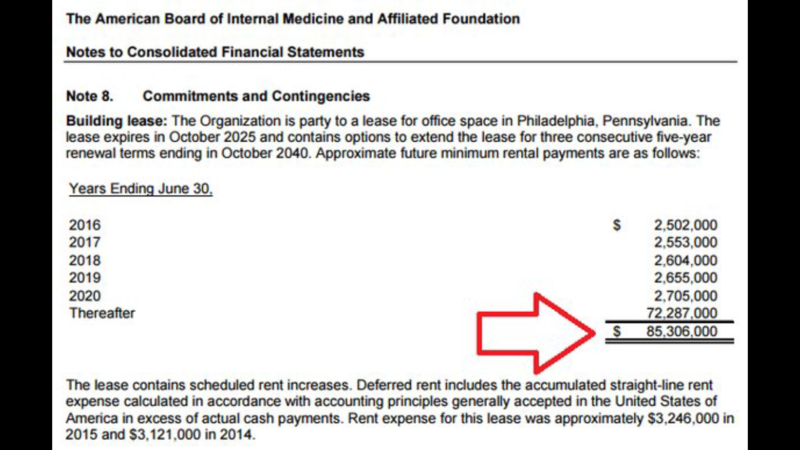 Lawyers from one of the largest law firms in Philadelphia, Ballard Spahr LLP, are representing the ABIM - all paid for by millions of dollars of practicing physician testing fees. As you can imagine, the legal fees for Dr. Salas-Rushford's defense are significant. Last evening, a website (doctorsjustice.com) went live to help crowdsource Dr. Salas-Rushford's legal costs. The website contains more about Dr. Salas-Rushford and copies of documents important to his case (including the Langdon letter and the ABIM's final sanction determination). I encourage everyone to review his information carefully. Given what we know about the ABIM's recent actions, the secret funneling of funds from the ABIM to the ABIM Foundation from 1989 to 1999 to define their version of "medical professionalism," the use of physician testing fees for luxury condominium purchases, the concerning undisclosed conflicts of interest within the leadership of the ABIM (see here and here), the revolving-door collusion between CMS and the National Quality Forum, the undisclosed political lobbying of this tax-exempt 501(c)(3) organization, their strongman tactics, and their propensity to advertise their self-determined sanctions to mainstream media before due process, it is time practicing physicians demand justice and a full investigation into the ABIM's methods of securing their lucrative physician "quality cartel." Dr. Salas-Rushford's suit against the ABIM promises to shine a very bright light on the practices of the ABIM whether his case is upheld or not. For that reason, I encourage all practicing physicians, irrespective of specialty, to donate in whatever way you can - $5 or $500 - to his legal fund. You can also help by sharing his website and encouraging others to do the same. It's time for practicing physicians everywhere to hold the ABIM accountable. We’re in the midst of a rebellion. The bottom and middle are pushing against the top. It’s a throwing off of old claims and it’s been going on for a while, but we’re seeing it more sharply after New Hampshire. This is not politics as usual, which by its nature is full of surprise. There’s something deep, suggestive, even epochal about what’s happening now. Physicians, too, are rebelling against the established sheltered and elite institutions of the House of Medicine: the ACGME. I can see it. I feel it. I mention this to say we are in a precarious position in the U.S. with so many of our institutions going down. Many of those pushing against the system have no idea how precarious it is or what they will be destroying. Those defending it don’t know how precarious its position is or even what they’re defending, or why. But people lose respect for a reason. So true. Greed does this to people. So does money. It will be interesting to see where things land but one thing is for certain, the staid bureaucratic institutions within the House of Medicine are in trouble and they brought this on themselves. It's been over a year since you told us your now famous mea culpa message that said you "got it wrong" with your Maintenance of Certification (MOC) program. And yet the program still continues despite everything your colleagues have disclosed about this travesty to our medical profession. You've suspended (temporarily to the end of 2018 when MACRA blossoms forth) Part 4 of the MOC program with its Practice Improvement Modules and Patient Safety and "Voice" sections because you were caught red-handed performing research on physicians for your own gain. You've finally stopped making residents pay for "maintaining" their certification before they even sat for their first certification examination. You also stopped requiring that physicians subject themselves to a "double jeopardy" situation where those with more than one Board certification had two pass BOTH examinations to maintain each one of their certifications. You also made sure you took down the comment section on your blog. So much for transparency and a sense that you really cared what your practicing colleagues thought about your program. And now, according to Stephen Weinberg, MD at the American College of Physicians in a recent email to ACP members, you've been "addressing any factors that might be contributing to the relatively high failure rates" by "making changes to the most recent internal medicine MOC examination administered in October" and "changing the process" for setting the pass rate cut-off resulted in ABIM reporting "a notably higher pass rate for the 2015 Internal Medicine MOC examinations." It seems those declining pass rates that you dismissed in your Medscape interview were getting lower after all. But what STILL hasn't happened more than a FULL YEAR later is tell us about all about the money and the secret deals. You haven't explained why you funneled over $70 million of our testing fees from the ABIM to your secretly-created ABIM Foundation. You haven't explained why you paid Christine Cassel, MD a whopping $8.9 million from May, 2003 through 30 June 2013 and allowed her to earn another $1.9 million from Kaiser Foundation Health Plans and Hospitals and $230,000 in cash and stock from Premier Inc while she was supposedly working full time at the ABIM. And why on earth did Ms. Langdon - a non-physician administrator - deserve a bonus of over $297,646 in fiscal year 2012? Was it because of all those sanction letters she sent out to physicians acusing them of cheating? You haven't explained why cash-flush ABIM Foundation had to purchase a $2.3 million luxury condominium complete with a chauffeur-driven Mercedes S-Class town car. Was it really as an "investment" or was this another perk for Ms. Cassel as she and her husband flitted back and forth from Philadelphia to their home in Arizona? You also haven't disclosed how test and physician demographic and practice data, paired with your unproven re-certification metric, are being sold to the likes of CECity Premier, Inc and others for political and personal favors. It is now clear to practicing physicians everywhere that you can't let go. That's what happens to people who have an addiction problem. Given these and prior actions it is clear you have an addiction. You are addicted to spending other people's money. And we understand that when an addict is caught with their hand in the cookie jar, they get creative with new ways to support their habits and obsessions. They change the rules. They make fellow doctors co-dependents. They make others feel guilty for not playing the game and not paying in. They even result to strongman tactics with threats of revocation of board status and using threats of Copyright infringment to protect the money flow. Anyone who has ever had a loved one caught in this viscous addiction cycle understands. This is what the hostile-dependent relationship with an addict looks like: untrusting, two-faced, dysfunctional, love-you-one-minute-then-stab-you-in-the-back, sneaky. Back then as it is now, the ABMS/ABIM MOC participation was born upon a strongman/boss approach, not on proof of its value to patients or our profession. But there's still time. You can start your 12-step process, but first, you must admit you have a problem. Committing to an $85 million lease through October 2040 and shaking down your fellow physicians for your extravagent ways is part of the problem. But you know and I know there's even more behind the scenes. You really don't want us to tell the rest of the story and all of the sneaky and disturbing ways you secured your monopoly. This story is very messy, Gruber-esc, indeed. It will take bravery and resolve, but you can do it. I would suggest you come clean. Stop trying to clean up your horrible MOC mess. Change your bylaws to one that supports working physicians, rather than yourselves and your "stakeholders." Insist that ALL financial and political efforts be disclosed - that's right: ALL of them - including all of your leadership and directors' securities deals and consulting arrangements. Disclose all of the fees that flow between professional societies, medical journals, and other members of the ACGME hierarchy as well. Dissolve the Foundation and return the money to those who funded it: practicing physicians. Make certification free for the next ten years (the same amount of time you (quite literally) stole from us for your political agenda). And stop insisting that MOC can be improved when it's clearly little more than a corrupt, dysfunctional, and untrustworthy self-created credential for your income stream. MOC (and all the sickening and non-transparent permutations that keep getting created) needs to end completely. Because here's a secret: clinical doctors won't participate in this program without these actions to dissolve MOC, no matter how much pressure you and your cronies apply. Reference: Glassock RJ Benson JA, Copeland RB, Godwin HA, Johanson WG, Point W, Popp RL, Scherr L, Stein JH, Tounton OD. Time-Limited Certification and Recertification: The Program of the American Board of Internal Medicine. Ann Intern Med 1991; 114(1): 59-62.